The general secretary of the Unite union has written to the Prime Minister on the fortieth anniversary of the 'Shrewsbury 24' trial, calling for a review. Six workers, including the actor Ricky Tomlinson, were jailed in 1972 for their trade union activities. They had been picketing construction sites in Shrewsbury in support of a nationally called builders strike. Len McCluskey said: _“It was forty years ago today (3 October) that 24 construction workers were put on trial in Shrewsbury for their trade union activities. “The workers have been protesting their innocence ever since and are progressing an application to the Criminal Cases Review Commission." Campaigners hoping to overturn convictions for conspiring to picket building sites during a national strike in 1972 have rallied support at Westminster. Actor Ricky Tomlinson was one of those jailed at Shrewsbury Crown Court for his part in the action. The campaingers are angry that the Government is refusing to release documents linked to the affair until 2021 on the grounds of national security. The Royle Family actor Ricky Tomlinson will today urge the government to release documents relating to the "Shrewsbury 24" case. 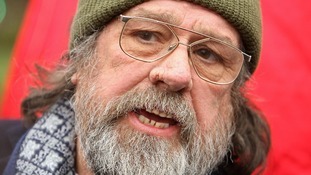 TV star Ricky Tomlinson today made an appeal for 40-year-old convictions against 24 pickets in Shrewsbury to be overturned. Ricky Tomlinson is campaigning with the Shrewsbury 24 to have a 39-year-old conviction overturned relating to the building workers’ strike.